The 2011 SEMA Show was the scene for the debut of the Oakley Surf Tacoma. From the coast of Baja to the cold water of Santa Cruz, Calif., the Oakley Surf Tacoma has the ability to live at the beach and go anywhere in search of mega waves. Australian surfing pro Tom Whitaker talked about the Oakley Surf Tacoma at a press conference in the Toyota exhibit at the SEMA Show. 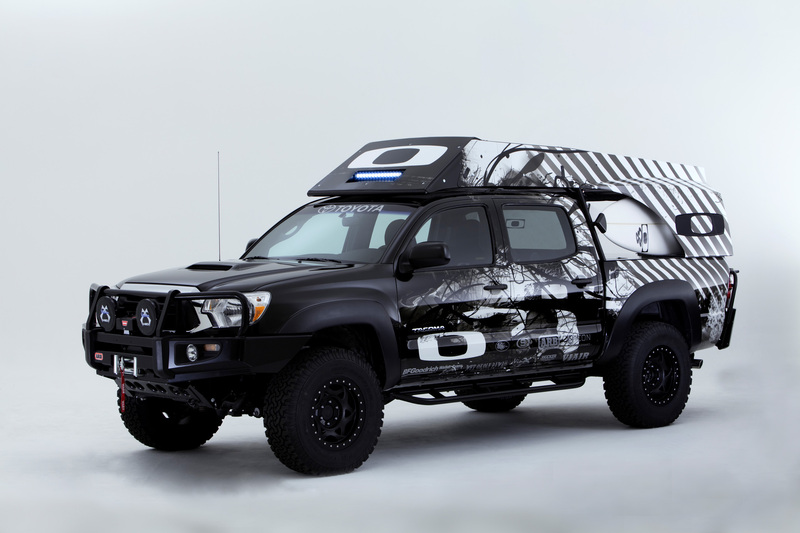 Built using a rugged Toyota Tacoma 4×4 pickup equipped with a V6 engine and TRD supercharger that generates 304 horsepower, the truck was customized by Smithbuilt to be a Surfing Big Wave Assault Machine. Additional performance modifications include a Flowmaster stainless steel exhaust, an ICON stage 3 lift kit, Billet top A arms, new leaf springs for added height, a new front coilover system, and Walker Evans 17 x 8 bead lock wheels with a flat black finish mounted to BF Goodrich 285/75-17 all-terrain tires. Inside modifications include Wet Okole Hawaii custom embroidered seat covers, Topstitch interior modifications on the door panels, head liner and carpet kit throughout, a Kicker sound system and an Oakley icon. This unique Toyota Tacoma is a surfer’s dream as it is equipped with a purpose-built roof racking system for heavy hauling and can be accessed with ease for surf bag stowage and multiple board storage. 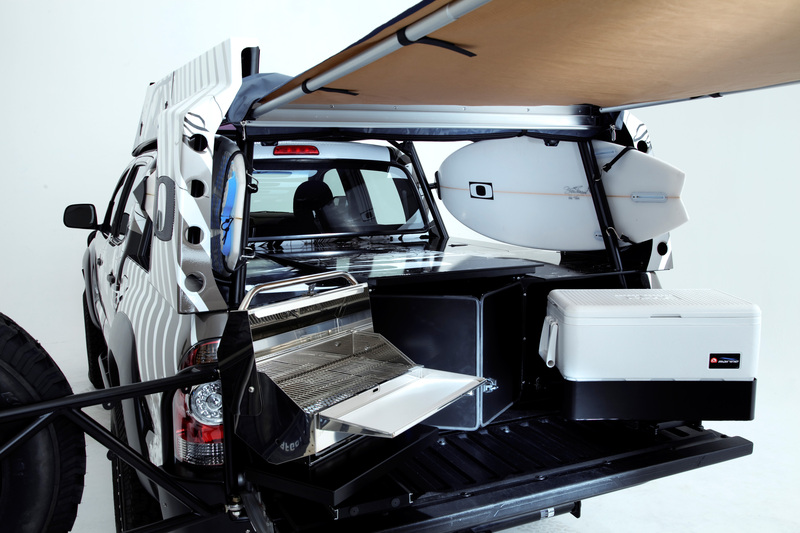 The truck bed system, which has a lot of storage for wet suits and other equipment, also comes with an ice chest and barbeque grill. Meals and cold drinks can be enjoyed under a shade system that is equipped in the back of the roof rack system. Living comfort is also achieved with and integrated shower system. Illumination is supplemented with Vision X lighting in the bed and front driving lights. After SEMA, the Oakley Surf Tacoma will follow the waves and appear at all Oakley surf competitions. Surf’s up!